This paper explores video game trailers, their various forms and the roles they play within video game industry and culture. It offers an overview of the current practice of video game trailer differentiation and proposes a new typology of video game trailers based on their relation to ludic and cinematic aspects of a video game, combining the theory of paratexts, video game performance framework, the interface effect concept, as well as the concept of transmedia storytelling. This typology reflects the historical evolution of a video game trailer and also takes into account current trends in the audiovisual paratexts of video games. Trailers originated in the American movie industry in the 1920s (Kernan, 2004). Over the course of the 1990s and 2000s, however, they were gradually adopted by other entertainment industries, like video games (Young, 2007), book publishing (Voigt, 2013) and performance arts (Preece, 2011). Originally, the main purpose of a trailer was to promote and advertise a movie. Their deployment was in line with Genette’s (1997) sense of the paratext, functioning as a vestibule or shopping window for the main text. Over time, trailers have become more diverse and their functions and authorships differentiated. While the notion of trailers as paratexts is contested at the moment – some scholars uphold Genette’s tradition (Gray, 2010; Kernan, 2004; Preece, 2011) while others criticize it for its vagueness (Johnston, 2011) – I will stick to the paratextual approach to trailers in this paper to better illustrate different relationships between the trailer and the main text, not just the promotional function. The validity of use of this literary theory concept also stems from its wide adoption by game studies scholars (see Consalvo, 2007; Galloway, 2012; Jara, 2013; Jones, 2008; Payne, 2012). For the purpose of this paper, I will define the official video game trailer as any official audiovisual paratext that informs the viewer about the existence of a particular video game. In the next two sections, I will first provide an overview of current practices in video game trailer categorization and then propose my own theory-driven typology. 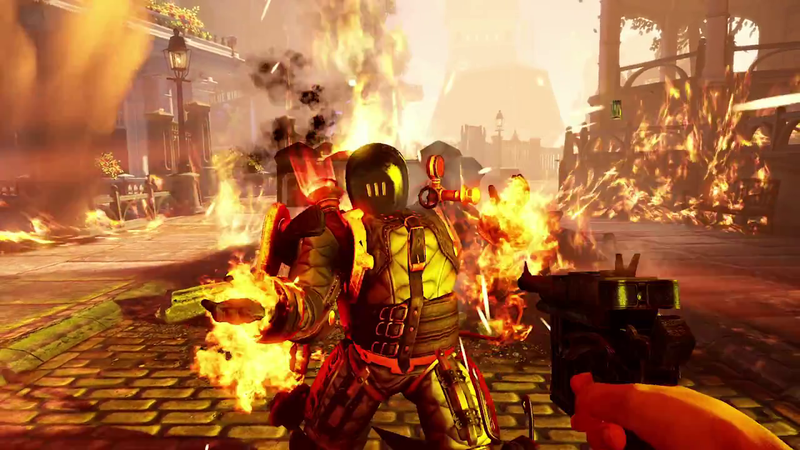 Still from the Bioshock Infinite: Beast of Columbia trailer, an example of a performance trailer. According to Young (2007), early video game advertising was preoccupied with explaining how hardware works and how it transforms passive entertainment into a more active mode of engagement. After this initiation period, “the actual purpose of the advertising has changed from one of teaching users how to use the system to publicizing specific games in a manner very similar to film trailers.” (Young, 2007, p. 235) If we were to look for the first trailer in the history of the video game industry, the Zaxxon (Sega, 1982) televised ad from 1982 is the likeliest candidate. While the thirty second spot still focuses on the hardware aspect of the arcade machine, the voiceover also describes the specificities of the game and the experience it can provide. In the 1990s, video game trailers became a standard marketing tool. The increasing popularity of this type of promotional content was confirmed by the founding of the website GameTrailers.com in 2002. The site was acquired three years later by MTV Networks. Trailers also play a significant role at video gaming exhibitions such as the Electronic Entertainment Expo which dates back to 1995. Over time, trailers have diversified, partly due to the development cycles of big budget video games. Carlson (2009) lists some basic types of trailers, but the practice is much more complicated. Publishers use different adjectives to differentiate between specific forms of trailers released for a given game. There is, however, no common approach. Before moving on to a more theory-driven typology, I would like to describe some of the criteria used in PR discourse to distinguish between various official video game trailers. Bear in mind that this categorization is not meant to be exhaustive. Its primary aim is to illustrate the current practice of categorizing trailers without a fixed or shared typology. As Carlson (2009) points out, the first and most obvious criterion is the nature of content (or footage) used in the trailer. We can, for example, differentiate between gameplay footage, pre-rendered CGI animation and live action footage. The second criterion, also noted by Carlson (2009), is the release date of the trailer in relation to the development cycle of a given game. From this perspective, we can talk about teaser, reveal, announcement and launch trailers. The third criterion is the original venue of a trailer release. While trailers are predominantly watched online (Johnston, 2008), the location of their initial unveiling is occasionally used to differentiate between trailers for one game. Significant examples include E3, Gamescom or Tokyo Game Show trailers. The fourth criterion is the particular focus of a trailer. While some trailers may strive to represent the whole package of a game, others pinpoint individual features. Such focus can range from story to gameplay, highlighting combat, single-player or multiplayer campaigns. It is important to note that the above-mentioned criteria are used very freely by publishers, journalists and audiences. Publishers tend to use just use one criterion to describe a trailer, even though it is often possible to apply all four criteria. The trailer types assigned using these four criteria are overlapping as they are in no way mutually exclusive. Still from the Dragon Age: Origins – Sacred Ashes trailer, an example of a transmedia trailer. While it is possible to use the aforementioned criteria to construct a typology of video game trailers, the outcome would be very descriptive and overly focused on the formal qualities of a trailer. I can, instead, propose a typology based on the relationship between the video game and its paratext, taking into account the conceptualization of a video game as an interplay between rules and fiction (Juul, 2005). This approach will allow us to look at how these two sides of a nonlinear text are represented in mostly linear trailer paratexts. As a paratextual genre with origins in the movie industry, a video game trailer comes with an inherited cinematic quality. 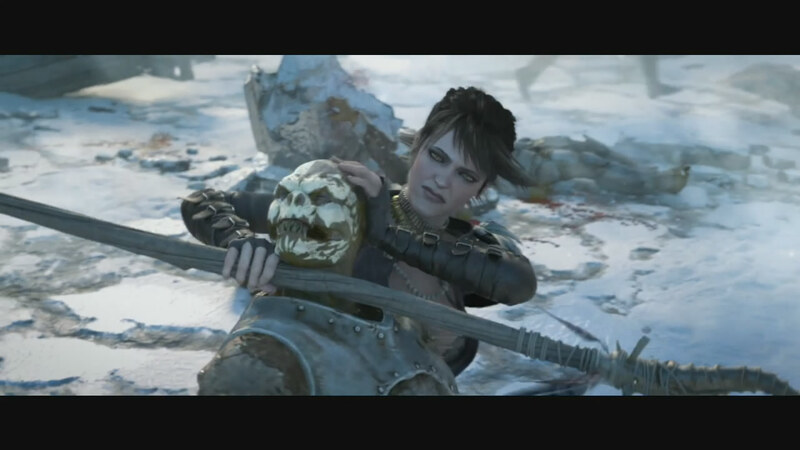 This cinematic aspect in its linear nature is well suited to the representation of a video game’s fictional world and, especially, its narrative. At the same time, the ludic elements that constitute the cybertext nature of a video game (Aarseth, 1997) should also be represented in any trailer whose intent is to provide a holistic impression of the game. But there are limitations to the ways in which a trailer, a linear paratext, can represent a video game, a nonlinear text. I will begin my typology in the realm of video game advertising, which focuses on players and their interaction with the hardware. This focus reappears periodically whenever new gaming hardware is introduced to the market. That said, such focus is not restricted to the promotion of hardware; it can be present in the promotion of particular video games, as seen, for example, in the genre of rhythm games. Still, this player interaction is staged for the purpose of a video game trailer. Using the perspective of performance framework (Fernández-Vara, 2009), we can establish a category of performance trailers that show us staged gameplay either from the perspective of a spectator looking upon players interacting with the game, or from the perspective of a spectator looking at the game screen itself. These two spectator positions are often combined within trailers to give credibility to the representation. Performance trailers generally focus on the ludic aspects, showing the viewer a possible gameplay experience in very linear fashion. We can think of nearly every video game trailer as a case of cross-promotion or transmedia (Jenkins, 2006). Video games and video game trailers are, after all, different media channels. This practice of “exploiting forms of promotion as content, and indeed vice versa […]” (Freeman, 2014, p. 2372) dates back to the early 1900s. In this sense, I talk about transmedia trailers as expanding the fictional world of a video game beyond the boundaries of a video game as a medium. Content-wise, they can consist of a substantial amount of footage – live-action or CGI – specially created for the trailer. Transmedia trailers can be used as a tool of transmedia storytelling and they tend to represent the fictional world of a video game in a linear, cinematic manner. The last type of video game trailer deals with the inherent interactivity of a video game. Some publishers seem aware of the limitations attendant to representing a nonlinear text through the use of a linear paratext and try to overcome them by creating so-called interactive trailers that enable limited viewer agency by, for example, allowing a choice between pre-recorded stealth or combat gameplay. These trailers strive to recreate the interactivity of a video game by replicating the interface of a video game, effectively establishing two layers of paratextuality. Applying Galloway’s notion of interface effect (Galloway, 2012), interface trailers make the non-diegetic (or paratextual) layer of a video game tangible by mimicking it. Interface trailers, themselves a paratext, employ the notion of interface to represent the ludic aspects of a video game and to convey its non-linearity. 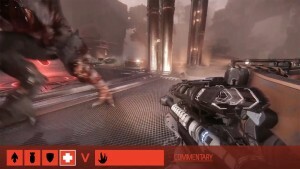 Still from the Evolve 4v1 trailer, an example of an interface trailer. In this article, I quickly covered the theoretical approaches to the genre of video game trailers and created an overview of formal criteria used by publishers to differentiate between video game trailers. I also proposed a typology rooted in the theoretical concepts of performance framework, transmedia and interface effect, consisting of three categories based on the relationship between the paratext, the video game and its ludic and cinematic aspects: performance trailers, transmedia trailers and interface trailers. This typology aims to organize academic discourse on video game trailers and to act as a starting point for further research in production, content and audience reception of video game trailers. This paper was supported by the Charles University in Prague, project GA UK No. 306414. Aarseth, E. J. (1997). Cybertext: perspectives on ergodic literature. Baltimore, MD: Johns Hopkins University Press. Carlson, R. (2009). Too Human versus the enthusiast press: Video game journalists as mediators of commodity value. Transformative Works and Cultures, 2009(Vol 2). Consalvo, M. (2007). Cheating: gaining advantage in videogames. Cambridge, MA: MIT Press. Fernández-Vara, C. (2009). Play’s the thing: a framework to study videogames as performance. In DiGRA Proceedings 2009. Cambridge, MA: Authors & Digital Games Research Association. Freeman, M. (2014). Advertising the Yellow Brick Road: Historicizing the Industrial Emergence of Transmedia Storytelling. International Journal of Communication, 2014(8), 2362–2381. Galloway, A. R. (2012). The interface effect. Cambridge, UK ; Malden, MA: Polity. Genette, G. (1997). Paratexts: thresholds of interpretation. Cambridge ; New York, NY: Cambridge University Press. Gray, J. (2010). Show sold separately: promos, spoilers, and other media paratexts. New York, NY: New York University Press. Jara, D. (2013). A Closer Look at the (Rule-) Books: Framings and Paratexts in Tabletop Role-playing Games. International Journal of Role-Playing, (4). Jones, S. E. (2008). The Meaning of Video Games: Gaming and Textual Strategies. Routledge: New York, NY; Abingdon, UK. Juul, J. (2005). Half-real: Video Games Between Real Rules and Fictional Worlds. Cambridge, MA: MIT Press. Kernan, L. (2004). Coming attractions: reading American movie trailers (1st ed.). Austin, TX: University of Texas Press. Wolf, M. J. P. (Ed.). (2008). The video game explosion: a history from PONG to Playstation and beyond. Westport, CT: Greenwood Press. Young, B.-M. (2007). The Disappearance and Reappearance and Disappearance of the Player in Videogame Advertising. In Situated Play, Proceedings of DiGRA 2007 Conference. Tokyo: 2007 Authors & Digital Games Research Association.